Although the Internet has no reputable or well-established sites that discuss the formal rules of the card game, "Fruit Salad," an underground community of players play the fruit salad card game, sometimes referred to as "Canadian Fruit Salad." Although it may be a relatively new game, having spread among friends at house parties, the few online forums and blogs that mention the game come to a general consensus for the basic rules of play. You may come up with or have your own version, and can transform it into a world-renowned card game. The object of the Fruit Salad card game is to have the least amount of points by the end of the game. Since it is a trick-taking card game, players do their best to avoid collecting tricks. A game lasts for six sets. One set is complete when all the dealt cards are played. At the beginning of each set, the dealer shuffles and deals out the entire deck of cards. However, each player must have an equal amount of cards. Since the jokers are not included, a 52-card deck must be partitioned equally. For example; if there are three players, each player must get 17 cards, leaving one card to be discarded. In the case where cards must not be used, it is the dealer's responsibility to remove the lowest valued card(s). Since Ace, followed by King, Queen, Jack and so forth, is the highest, the dealer must remove the 2(s) and so on. After each set, the player to the left of the previous dealer becomes the new dealer. 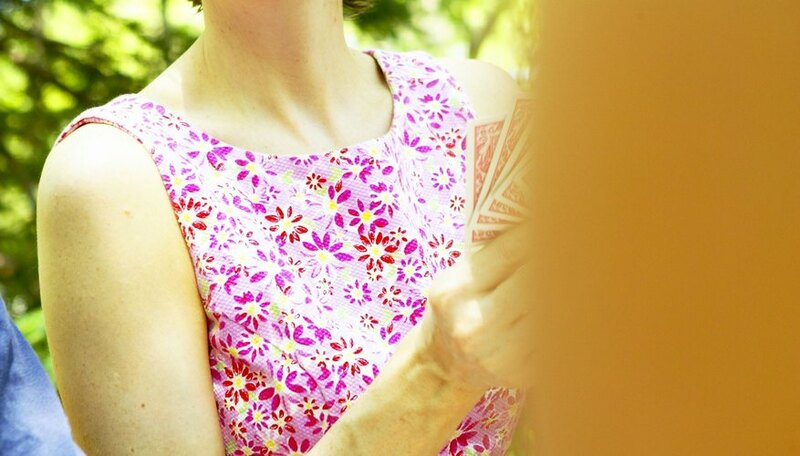 The player to the left of the dealer lays down any card from her hand first; the card must be face-up so everyone can see it. Players, in a clockwise direction, lay a card face-up after the first player; their cards must be of the same suit as the card first played, unless they do not have one of that suit. Once the play goes around the table once, the player who laid the highest-value card of the original suit takes the trick. The first set continues, with a trick being taken after all players lay one card down, until all the cards are played. A total of six sets are played. At the end of each set, players who took tricks during that set must tabulate how many points they earned. The rules for points changes with every set. After set 1, a player earns 10 points for every trick he collects. After set 2, the player earns 10 points for every heart card contained in his trick pile. After set 3, the player earns 25 points for each queen card in his trick pile. After set 4, the player with the King of Spades in his trick pile earns 100 points. At the end of set 5, the player who won the last trick of the set earns 100 points. At the end of set 6, players who collected tricks earn points for each of the criteria from the five previous steps. Once the points are tabulated from all of the six sets, the player with the least amount of points wins. Games Forum: Game Called "Fruit Salad"